The Tampere-based Nem Agency is on a righteous path. 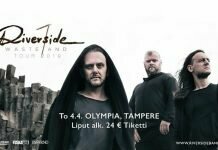 Their artist roster is full of prominent names from Finland as well as abroad, and for example, their Metallihelvetti festival in Viikinsaari, Tampere, has already cemented their place in the Finnish festival summer season. Nem’s latest creation, Metal Crane Festival, held for the first time this year, caters to the needs of a mid-sized club festival, but as a specialty, the event took place in Helsinki and Jyväskylä simultaneously: the bands that took the stage in Helsinki on Friday performed in Jyväskylä on Saturday, and vice versa. Helsinki’s Friday lineup consisted of Kalmah and Catamenia, both being long-distance runners from Oulu; Brymir, a folk/death metal act originally from Sipoo; and a more recent melodic death styled contender, Among the Prey from Jyväskylä. On Saturday, Nosturi hosted Harakiri for the Sky, a rising black metal act from Austria, the Tampere-based ‘samurai metal’ group Whispered, Bloodred Hourglass from Mikkeli, and The Hypothesis, originally from Kouvola. Originally, the Helsinki event was to be held in Nosturi’s downstairs bar, but since pre-sale tickets were sold out several weeks before the festival, the festival was understandably moved to the upstairs main stage. I arrived at Nosturi with little time to spare, as Among the Prey was set to kick things off only 15 minutes later. Fortunately there was no queue at the door, but consequentially, as the band began their set at 20:20, only twenty or maybe thirty people were present upstairs. The band, all of them being experienced players, didn’t seem to mind and went through with their 30-minute set with a good amount of intensity. They weren’t at all familiar to me beforehand, and I probably wouldn’t listen to their stuff at home, but the band’s metalcore-ish melodic death metal set the mood nicely for things to come. I still believe that Among the Prey did themselves a bit of a disservice by playing a cover, Lamb of God’s “Ruin”, as their last track, as it seemed to be their only familiar tune with the audience. However, bonus points go to the drummer, Atte “Anzelmosm” Palokangas’ ever-so-bushy and curly hair! Third up was Catamenia from Oulu. Despite the fact that they’ve recorded nine full-length albums and three compilations for Massacre Records over the course of 20+ years, I was pretty sure that I hadn’t, at least knowingly, heard a single track from them before this show. The set was kicked off with a couple of slower tunes, and the band’s melodic black metal – which was mixed almost disturbingly sharp in treble – didn’t quite catch me at first. The set got considerably better as it went on and the band changed languages to Finnish for older songs in the end. Throughout the show, the second guitarist, Sauli Jauhiainen, looked like he’d rather be anywhere else and played his parts with a blank stare towards his fretboard. Vocalist Juha-Matti Perttunen made little to no contact with the audience, and the keyboard player, Jussi Sauvola, had to take care of asking the audience to participate. Perttunen sang his low growling parts convincingly, but his more black metal-ish high screams sounded like he’d only used his throat – I hope his vocal cords had juice left on the following night as well. I hate to say this, but in my books, Catamenia had to settle for last place – there were too many things out of place. I might have been in the minority though, as most of the audience seemed to enjoy the show and a bunch of the band’s long-time fans were clearly present. Kalmah had the honor of wrapping up the Friday evening. 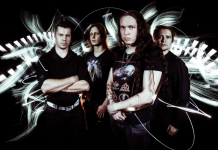 Not too many bands from the halcyon days of Finnish melodeath are left, as Norther called it quits several years ago and Children of Bodom’s discography has been obsolete for a decade, but fortunately Kalmah still goes on – there’s even a new record coming up! Their long career shows on stage in the form of an almost obscene confidence – I wonder if Kalmah has ever delivered a bad show. From the opening track, Seventh Swampsony’s “Pikemaster”, to the usual closer, “Hades”, the band played their songs with ease, and at times, faster than the album versions. Kalmah’s back catalog has produced many live staples like “For the Revolution”, “The Black Waltz”, or “Heroes to Us”, but they’ve usually done some digging as well, and as a fan of their The Black Waltz album, I was immensely satisfied to hear “Defeat” and “Bitter Metallic Side” live for the first time in what seemed like an eternity – they probably haven’t been played since the album’s release tour in 2006. Even “Dance of the Water” was played from their debut, Swamplord – nice! Could you scour through They Will Return and Swampsong next, please? In addition to their musical prowess, an integral part of a Kalmah show are the vocalist Pekka Kokko’s abysmally bad and, at the same time, ingenious jokes, and he didn’t let us down this time either. If there’s something negative to be said, their sounds ranged from moderately good to downright horrible at times, but since I know their songs by heart, it didn’t bother me. A very successful Friday indeed! I had managed to misread Saturday’s timetables and arriving at Nosturi went to the last minute – as I got in to the coatroom, The Hypothesis had already started with their set upstairs. As with last night, frustratingly few people had already found their way to Nosturi for the first band, but I have to say that if the scarce audience was still a bit stiff from last night, so was the band. Compared to the last The Hypothesis show I’ve seen, the vocalist Arttu Seppälä seemed a bit absent and got mixed up with his speeches a couple of times. He also went backstage every time a song had an instrumental section and didn’t seem to really connect with the audience. His growls were on point, though. One might call The Hypothesis’ mid-tempo melo-death as bit dull, but I strongly disagree – the band’s material is full of catchy hooks here and there, and their guitar patterns are pretty complicated, but guitarist duo Asko Sartanen and Juuso Turkki played them with ease. The brand new single, “Illusion Now”, introduced a more dynamic The Hypothesis sound, and its guitar parts had a nice Omnium Gatherum -type of feel to them. The band’s drummer, Rolf Pilve, who has played in about a thousand different bands, including Stratovarius, couldn’t participate on this night, but his stand-in, Antti Rantavuo from Crimson Sun, filled his spot admirably. In the end, even with the slight stiffness, The Hypothesis played a good show and hopefully attracted a bunch of new listeners. Like Brymir, the Mikkeli-based Bloodred Hourglass has worked towards success for over a decade already. Their debut album, Lifebound, didn’t appeal to me at all, but something mystical has happened afterwards, since their sophomore Where the Oceans Burn and the recent Heal both proved to be top-notch modern metal records. The front of the stage was absolutely packed as BRHG took the stage, and while I’m not a fan of the band per se, I don’t think that anyone present can deny the sheer quality of the show. The band was on fire throughout the set and the audience shouted and clapped without singer Jarkko Koukonen having to ask for it. Speaking of Koukonen – he’s an exceptionally good vocalist with a strong voice, and his experience in performing clearly shows in his stage presence. BRHG also performed with a stand-in member, as guitarist Lauri Silvonen couldn’t attend the band’s four-gig run as warm-up for Harakiri for the Sky. However, help was found near – his brother Eero filled in. The band apparently had had time for only one rehearsal, but one couldn’t have noticed. The setlist was naturally inclined towards Heal’s material, but tracks like “Times We Had” or “The Last of Us” are well worth playing. Representatives of BRHG’s record label had flown from Germany to see the show, and I might imagine them being in awe, as it was one of the best I’ve seen in a long time. Their development from the first shows I’ve seen in Mikkeli’s Jurassic Rock has been immense. If you have the chance, go and see the band! If BRHG was great, Whispered managed to be just a tad greater. I’ve said this many times, but it wouldn’t hurt to repeat myself: Whispered has been ready to conquer the world for a long time – now it’s only a matter of their label’s commitment to the cause. The band’s set, familiarly beginning with “Strike!” from their latest album, Metsutan – Songs from the Void, flattened the audience with even more force than usual. Jussi Kallava stepped down from the drummer’s seat before the band’s latest European tour, but his replacement, Ukri Suvilehto, is a world-class player. He blasted through the songs with considerably higher tempos compared to the band’s records, and especially the closing track “Bloodred Shores of Enoshima” was borderline technical death metal. It’s also great that Whispered hasn’t forgotten their debut album, Thousand Swords, because while the quality difference compared to the second album, Shogunate Macabre, is rather steep, the album’s title track fit the set nicely. Still, it’s a shame that Shogunate Macabre’s “Jikininki” has been dropped from their usual set. Overall, Whispered’s show was lethal enough to make me think that Wintersun must’ve been in real trouble with these guys during their tour together. As the festival’s final act, the only foreign band, Harakiri for the Sky, took the stage. I first found out about them after their second album, Aokigahara, making me an instant fan. I actually took a head start in seeing them live this week, in Tampere on Thursday, so the band’s Nosturi show didn’t offer any surprises, but compared to the Tampere show, the atmosphere was ten times better – the Tampere audience was pretty quiet and the show’s lighting was one of the dullest ever. If there’s something that I disagree on with the band, it is the need to open their set with “Calling the Rain” from their third album, III: Trauma, as the song is slightly too slow and long to be played first. From “Funeral Dreams” onward, the set was expectantly crushing. The band’s total lack of contact with the audience and especially vocalist J.J.’s indifferent performing style created some funky contrast with the previous bands, and when I had to take a bathroom break mid-song, this one gentleman approached me and asked if I’d seen the band before, and why J.J. was “so messed up.” I didn’t want to be rude and ask him if this was his first black metal show. The band came on stage, played nearly an hour and a half of their best material and left – perfect! After last summer’s Finnish shows, the band’s drummer had apparently changed, which was only a good thing, as the previous drummer dropped tempo well over 20 beats per minute on every blastbeat section – on this night the songs were kept together flawlessly. “Jhator”, the Aokigahara masterpiece, concluded Harakiri’s main set before a short backstage break and “My Bones to the Sea” was the evening’s final song. As a whole, I enjoyed the show to its fullest, but a good deal of the audience seemed to disagree, as almost half of the people present had made their way downstairs or home before the end. If black metal categorically divides people, Harakiri for the Sky seems to serve an excellent example of this. Metal Crane Festival 2018 was a really successful event already on its first run-through. The lineup was such a relevant combination of older and newer bands, and the 25€ 2-day tickets were practically a steal. By moving the festival to Nosturi’s upstairs would’ve allowed for removal of the age limit, but since lately the amount of minors attending shows has been really small, I believe not separating the bar area was the right way to go. What’s really ingenious was the idea of switching lineups between Helsinki and Jyväskylä, as Finland is a country of long distances, and it’s not nearly as big of a deal to travel from Oulu to Jyväskylä to see a show as it would to Helsinki. The only negative remark goes once again to Nosturi’s bar pricing – the prices were once again raised, and 7,50€ for a can of Lapin Kulta is beginning to be ridiculously expensive. As of the writing of this report, the festival had already announced its return next year, so one can enjoy quality music next January as well. We’ll see you then!